Our flagship store is located in Altamonte Springs on Route 436 – Ronald Reagan Boulevard. On the South side of 436, we’re across from Altamonte Tires. You can’t miss the HUGE sign that reads, “Vintage. Antiques. Furniture.” We’ve recently taken over the entire plaza, custom building over 60 custom designed living spaces in this 40,000 square foot megastore! Our megastore is more than just a home decor store. It’s a destination. An adventure. An exploration. At every turn, you’ll discover something new or old either way, it’s unique. Let your inspiration run wild as you wander through the maze of individual boutiques curated by individual artisans. But we can’t promise you won’t fall in love with the life size living spaces you wander through. Give yourself plenty of time to just wander and explore this massive creative destination. 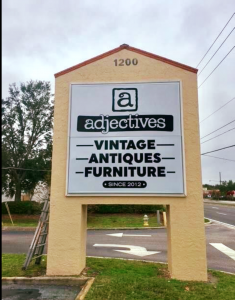 Bring your friends and family to Adjectives Altamonte and make a day of it! Our Grand Opening of the all new Altamonte Megastore was held on January 7th, 2017 after over a year of custom designing the new space. 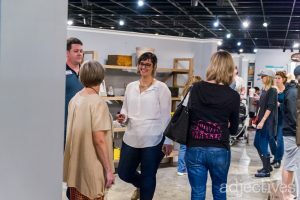 At Adjectives Altamonte, we host monthly events including Member Meet & Greets, as well as a wide range of painting and photography workshops. You can find all of our upcoming events on our facebook page.